One of the most amazing things about antique rugs is the dazzling array of colors they come in. Perhaps even more astounding, however, is the way that those colors seem to defy time, staying true to their original shades for decades or even centuries after they're first woven. Of course, there's no magic involved in making the quality of colors that antique oriental rugs are known for. In fact, it's quite the opposite, with the most mundane of natural ingredients coming together to produce a seemingly supernatural result. In the old days, there were two main ingredients for producing a top-quality rug. The first was good, shiny, lanolin rich wool with long fibers, which is actually somewhat more rare today than it was then. The second was good, rich, natural colors, derived from a range of plants, minerals and insects. The processes used to create natural dyes was the result of centuries of trial, error and scientific discovery, resulting in colors that can last for hundreds of years and stay true despite numerous washings or long stretches of time in strong light. But while the most common colors to spring to mind when thinking of these pieces is a warm camel-hair tone or bright, eye-catching red, one of the most attractive shades to ever grace an oriental rug is actually blue. Like the rugs themselves, blue is a shade that never really goes out of style. 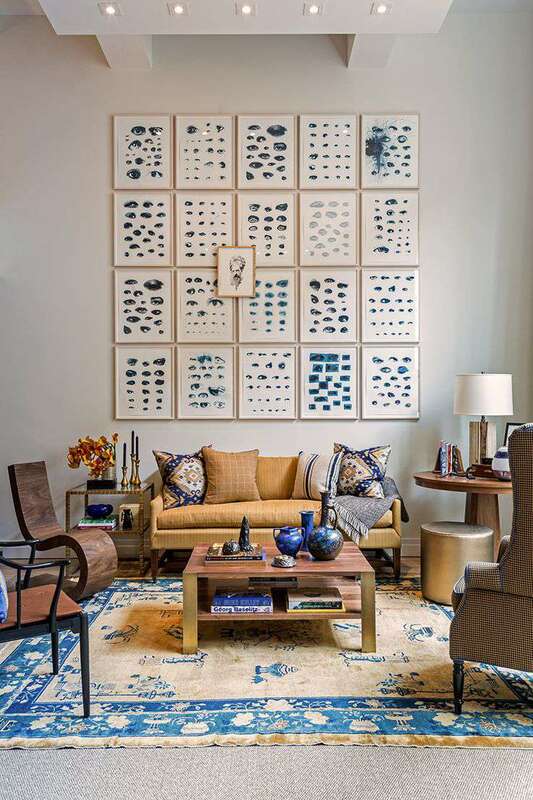 And like the rugs, blue can have a powerful impact on the look and feel of your home. Though blue is extremely common now, that wasn't always the case. In fact, blue was a particularly important color, with a history that goes back to ancient times. The color was most likely introduced into Europe from India in the Greco-Roman era, around 700 B.C. Yet it remained rare and expensive until Vasco de Gama created a new sea route to India in the 15th century A.D.
Blue was usually derived from two plant sources, woad and indigo. Most of the blue we see today, used primarily in blue jeans, is a synthetic version of natural indigo. Yet, at least in the rug weaving areas of the Middle East, such as Turkey, it's believed that the use of woad predated the use of indigo, but that it was eventually phased out in favor of indigo. In addition to creating a wonderful variety of shades and tones, blue is also a key component when creating other colors. Wool dyed with pomegranate skins to produce a soft yellow or gold, will emerge in stunning shades of green once immersed into the indigo dye vat. Yarn dyed red with madder root, comes out in amazing shades of purple after the same indigo treatment. The process of creating particular colors with indigo is tricky, since the dye solution in the vat is essentially colorless. Indigo only turns blue once the yarns are removed from the vat and are then oxidized upon contact with air. Indigo is unusual as a dye, because unlike other colors, it does not penetrate the fibers but rather sits on the surface. Over time and with the abrasions that come about through use, we get 'faded' jeans and in rugs, green can 'fade' to something closer to the original yellow. However with indigo, there is no actual fading at all, since true fading only comes from exposure to light and UV rays. Instead, with indigo, it's the dye sitting on the surface of the fibers that falls off over time that gives the appearance of fading. Just like a great pair of old jeans, a great old rug will often show striations of color. While indigo blue was used all over the rug weaving world, some of the most distinctive rugs using blue were made in the Ningxia and Peking regions of China, in the 19th century, where blue and white was very popular. Their popularity spread rather quickly to posh, well-designed, elegant rooms in Europe and America, where they remain appealing to this day.